Sewing a Rope Basketled by Heather Hutchison Harris Making rope baskets is ridiculously fun! 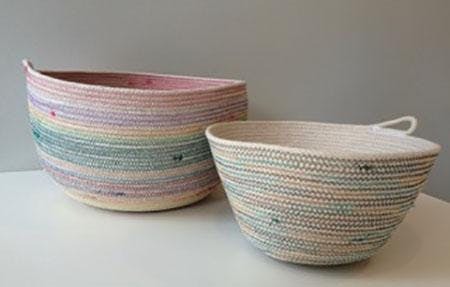 Using a zigzag stitch and cotton clothesline, we're going to make beautiful and functional baskets. This is a great project to use up all of those threaded bobbins. You can bring those with you - along with two spools of thread in your choice of colors - or use the bobbins and spools we will provide. Cotton clothesline provided. A limited number of machines are available, but you are also welcome to bring your own. If you want to bring your own, please select "own machine" when registering.No experience necessary.